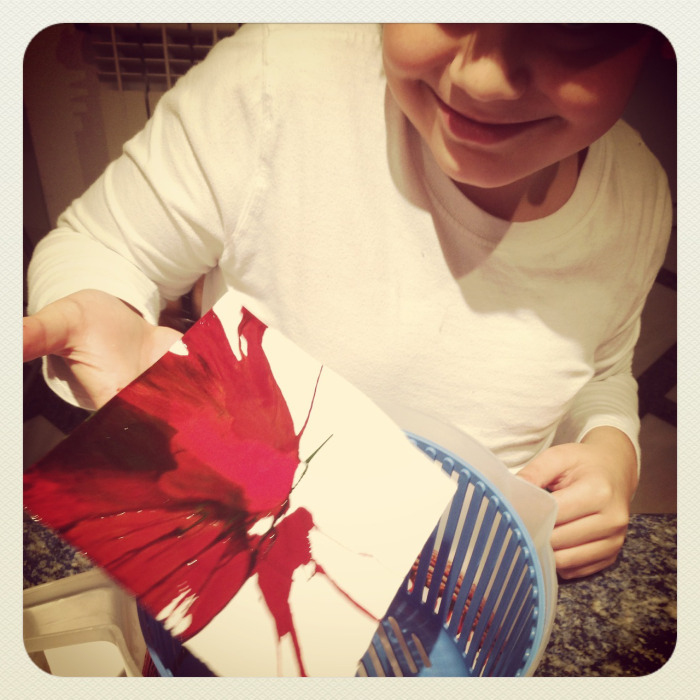 This is a super fun and easy activity to entertain the kids and make cool Art! Many of you probably have that thing (“I don’t know what it’s called :p), that you put the salad in and spin a little to dry after washing. Well, I had that thing for years and NEVER used it! Even though I thought he wouldn’t want to do it because, as he says : “Mom, I’m 9… Not a baby anymore…” He did, and loved it! So, no big explanations needed here. All you need is the “salad thing”, paper and some paint. You put the paper in, add the paint, you spin and voilá! Then you can try a lot of different ways to spin, as he did, and see what happens! We made tons of them. It is fun and creative!